I recently had cause to fire up my old Macintosh SE, one of the original all-in-one Macintosh models. It was donated to me by a family friend some years ago, but it was never of much interest to me, and as a result has spent more time gathering dust than doing anything else. …until recently. I needed some information on an old app that would not behave properly on any of my System 7 or later Macs. My long ignored Mac SE was running System 6, and so I set it up and powered it on. What immediately and absolutely impressed me about it was the speed of the machine! I know that saying “Macintosh SE” and “speed” in the same sentence may seem like a bit of an oxymoron, but the numbers bear it out. My Mac SE goes from power on to desktop in only 22 seconds, making it the fastest booting vintage Mac in the HappyMacs lab! In addition, applications seem to launch in a heartbeat and system shutdown is nearly instantaneous. What lay behind this remarkable performance? Well, for starters the SE is rocking an Applied Engineering Warp 030 Motorola 68030 CPU accelerator. Research into the available Applied Engineering Warp 030 accelerators of the day revealed that both 40 MHz and 50 MHz models were produced. There are no utilities loaded onto the SE (yet) that can tell me what clock rate my SE’s Warp 030 is running at but I plan to find out in the near future. However, an accelerator alone is not enough to explain the speed. A 68040 is generally understood to be 2x to 3x the speed of an equivalently clocked 68030. Given this, if I assume that my SE has the fastest AE accelerator that was made for it, the 50 MHz model, then the performance of the SE should be in the same rough neighborhood as a 25 MHz 68040 based Macintosh. Happily, I have one of those, a Quadra 660AV, and I measured its boot performance: 63s from the end of its power on RAM tests to full desktop, approximately 3 times longer than the boot time of the Mac SE. Astute users will quickly point out that this is not an apples to apples comparison (pun intended!). There might be RAM speed differences, there might be hard drive performance differences, and there definitely was a pronounced OS difference: the Quadra 660AV is running Mac OS 7.6.1 while the Mac SE is running Macintosh System 6.0.7. This last difference is the one I want to focus in on, because I believe it is the true story here. I wasn’t really sure how to calibrate the impact of this difference however. System 6 is nearly a wholly unknown territory to me. My experience with Macs started with the early versions of System 7 and moved on from there. I did a little web research and confirmed what the SE’s boot time suggested – System 6 is a speed demon, and despite its age, is still remarkably capable relative to its successor, System 7. System 6 ruled the Macintosh world from 1988 until System 7’s debut in 1991. During that period of time, Apple’s CPUs were clocked in the 8 MHz to 16 MHz region, RAM was expensive and not provided in generous amounts and hard drives were sized in the 10 MB to 100 MB range. In short, computers were relatively limited in the resources they provided, and their operating systems had to be in step with the constrained platforms they were deployed on. System 6 was light because it had to be! This begins to explain the performance of my Macintosh SE. When you couple a (for the time) beefy 50 MHz 68030 with a light OS that is more in step with a 16 MHz CPU, you begin to experience real speed. I decided to test this idea by pairing System 6 with a more typical machine of its day. I settled on the Macintosh IIsi as the test machine, a decision guided by the need to meet the very pragmatic requirements of (a) being reasonably available on eBay these days, (b) supporting System 6 and finally, (c) being clocked in the 16 MHz to 20 MHz range. I will report on the results of my testing in an upcoming post. For now however, I will note that this particular post may not occur for a little while. The Macintosh IIsi I purchased on eBay almost immediately introduced me to one of the truly vexing problems associated with working on really early Macs – blown capacitors on the motherboard. My next post already has the working title of “(Un)Happy Macs”, and will concern itself with the issues I encountered, and how they were overcome. Also of some interest, as I started to dig into System 6, was the very real problem of loading software onto a non-networked older Macintosh that supports only dual sided 800K floppies, a media type that has long since disappeared from both Macintosh support and public consciousness. I found two interesting workarounds and will share those in another upcoming post. I mentioned in my last post that perhaps the most “classic” way to access the HappyMacs software archive was to do so from a classic Mac, via the TurboGopher application. I have TurboGopher, which is a FAT binary, running on both my 68K Macs and my PPC Macs, and so it should work for any classic Mac you may have. I have tested it from Mac OS 7.6.1 onwards. This post is a mini tutorial on how to access the HappyMacs gopherspace from TurboGopher, and how to set the default font in TurboGopher so that the HappyMacs gopherspace renders nicely on your Mac. Let’s start with the default font. Like many gopherspaces, the HappyMacs gopherspace uses some ASCII art to make the site a bit more visually attractive. In order for this art to render properly, it is key that the Gopher client (TurboGopher in this case) uses a fixed width font. I have settled on the Monaco font for no particular reason other than that I like the way it looks, but you can use any fixed width font that appeals to you. However, all the screen shots below feature Monaco. That’s it! Note that the image of the classic Macintosh, and the “Welcome to HappyMacs” banner are both examples of the ASCII art I mentioned above. One last thing. All of us live in the modern age, even if we have a certain fascination with vintage Macintoshes and MacOS, and so we are attuned to the idea of web browser bookmarks. Wouldn’t it be nice to bookmark the HappyMacs archive so that you did not have to type in the address every time you wanted to access it? Well happily, TurboGopher lets you do just that, although it is not entirely obvious how to do this until you have walked through it the first time. So… let’s walk through the procedure here. When you start up TurboGopher, it presents two windows – the Home Gopher window and the Bookmark Worksheet. This later window is the bookmark list that we want to work with. By default it comes preset with a number of what were helpful gopher links back in the late 1990s. These days, they are all dead links, and need to be replaced with more current ones. Let’s add the HappyMacs archive to the list, and then delete all the others. To do this, follow the procedure above to arrive at the HappyMacs gopherspace site. Next, position your cursor on the window’s top bar and type Opt-c. This copies the gopherspace’s URL to an internal copy/paste buffer. Now, position your cursor on the top bar of the Bookmark Worksheet window, click once and type Opt-v. This pastes your HappyMacs gopherspace URL into the bookmark list. Finally, to get rid of the preloaded and now dead links, position your cursor on each of them, one by one, click once, and type Opt-x. This deletes them, one by one. When done, you should be left with just the HappyMacs gopherspace in your list. There is one other site you might wish to add. 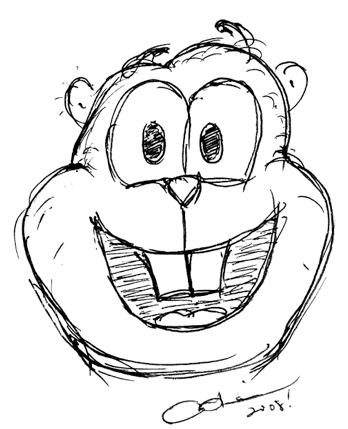 I think of it as the father of all current gopherspaces – gopher.floodgap.com. I have made it my Home Gopher in TurboGopher. gopher.floodgap.com is the gopherspace of the same Floodgap Systems people who bring you the Overbite plugin for Firefox and act as the general champions of Gopher in today’s world. You can follow a procedure similar to the one for arriving at the HappyMacs gopherspace to get yourself to the Floodgap gopher page and then add it to your bookmarks list. You may also wish to make it your Home Gopher, which you can do by editing the Home Gopher definition, available as the first selection in the Preferences dialog under the Gopher menu of TurboGopher. …and that really is it for this TurboGopher tutorial! I love serendipity. Today I was searching for a copy of Power Windows, a great Mac OS system control panel that provides a number of goodies such as full window dragging, translucent menus and more. Much to my surprise, the first entry that showed up in my Google search results was a file in a new (to me anyway) site called “Macintosh Repository” (www.macintoshrepository.org). In all of my travels through Mac Classic space, I have never encountered this site before. A quick check around the site made it clear that this is a serious repository of Mac OS abandonware, one with an enormous collection of software titles, many of which I have never seen before anywhere else. I have added this site to the Recommended Links list here at Happy Macs, and would encourage you to surf on over to the Macintosh Repository and have a look if you are on the hunt for a particular piece of software you are having difficulty locating. I did NOT find Apple’s Firewire 2.0, something for which the search continues, but I am still delighted to have stumbled upon the Macintosh Repository. This will not be the last time I visit. As for Firewire 2.0, I suspect that it will be found on one of the many Mac OS install disks I have – it will turn up sooner or later. A final note – Power Windows IS a great addition to any Mac OS installation with sufficient CPU horsepower to drive the effects, and will be the topic of an upcoming post. Until then, happy hunting at the Macintosh Repository! “A Mac software repository WHERE?”, you ask? In gopherspace, I reply. Those of you beyond a certain age may remember Gopher, a text based precursor to the World Wide Web. Gopher largely faded from public view with the emergence of the web, but I am happy to report that a dedicated band of vintage enthusiasts is keeping Gopherspace alive and well, and YOU can still access it today. You may reasonably ask why you would WANT to access such an anachronism, but it turns out that there are at least two very good reasons. First, as a reader of this blog, which is concerned largely with vintage Macs, you clearly have an interest in older technology. Gopher may therefore be an interesting avenue of investigation in its own right. If however this is not enough motivation to take a peek into the odd gopher hole or two, how about this? I have just found a wonderful little vintage Mac software repository in gopherspace, and you may just want to check it out. The repository in question is i-logout.cz and it has an interesting collection of both Mac OS and Mac OS X titles (plus PC, Amiga and more), many of which definitely qualify as “hard to come by”. I found a few programs I have been looking for for quite some time now, and you may too. Type that into your browser’s address bar just like you would an HTTP:// address. However, if you type that particular address into your browser right now, it won’t really know what to do with it, since the gopher:// part of the address will represent an unknown protocol to it. Happily, for those of you on Firefox, there is a plugin with the wonderfully tongue-in-cheek name of OverbiteFF that adds Gopher capability to your browser. and this page features a large “+ Add to Firefox” button. Simply press the button and follow the simple instructions, and you will quickly be rewarded with a Gopher capable version of Firefox. You Need WriteNow, Right Now! 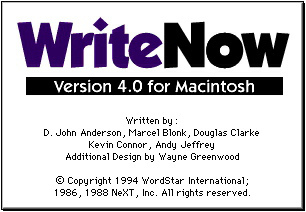 One of the long forgotten gems of the Macintosh world is the excellent and compact word processor, WriteNow. 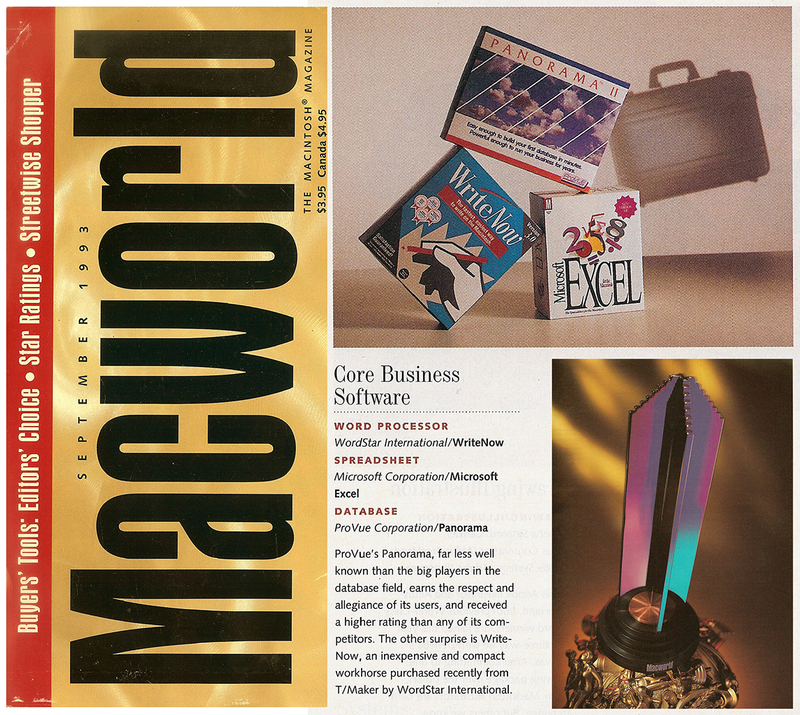 In the September 1993 edition, Macworld awarded WriteNow its World Class Award for the Word Processor category, edging out all other contenders, including Microsoft Word 5! All of this sounds compelling enough by itself, but you need WriteNow, right now, because in addition to its outstanding performance, small size and clean, easy to use GUI, WriteNow sports one last killer feature: it can read and write Microsoft Word files, as well as WordPerfect files, in addition to its own “native” format. 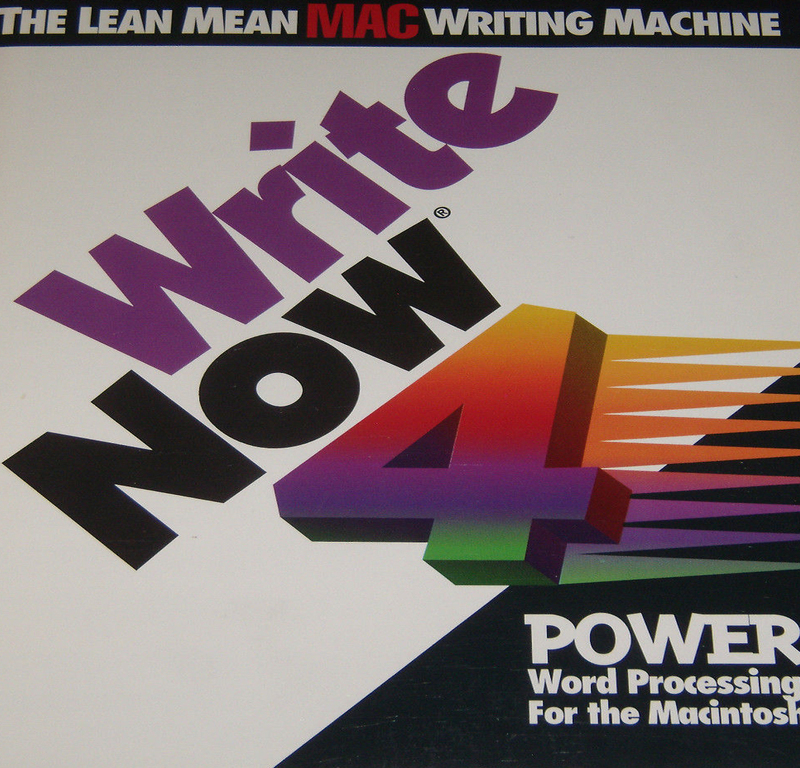 I tested WriteNow on two machines, a Quadra 840AV, where WriteNow ran native on the machine’s 40 MHz 68040 processor, and on a Power Macintosh 7300/200, where it ran under emulation on the beefy 200 MHz PowerPC 604e. I am happy to report that performance was snappy and responsive in both cases. It is interesting to compare file sizes as well. Using a specific test document with 51,494 characters, organized as 9661 words and 1026 lines, the file size for the MS Word .doc format of this file was 66,334 bytes. The WriteNow native format for the same document was 92,251 bytes, actually larger than the MS-Word format. This came as a bit of a surprise, but I guess WriteNow can’t be faster AND smaller! Pick up a copy of WriteNow and try it out. It remains a valuable word processor to this very day – lean, fast and light on resources… isn’t that what good software is supposed to be all about? 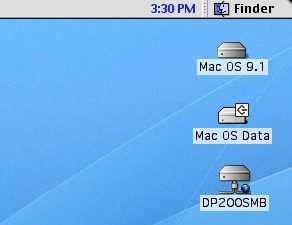 This is the third in our series concerning how to network your vintage Macintosh with its Windows peers of the day. The first two posts in this series covered accomplishing this with two fairly well known tools for this purpose, Thursby Software’s Dave, and Connectix’s DoubleTalk. Both of these use the SMB protocol to achieve networking. 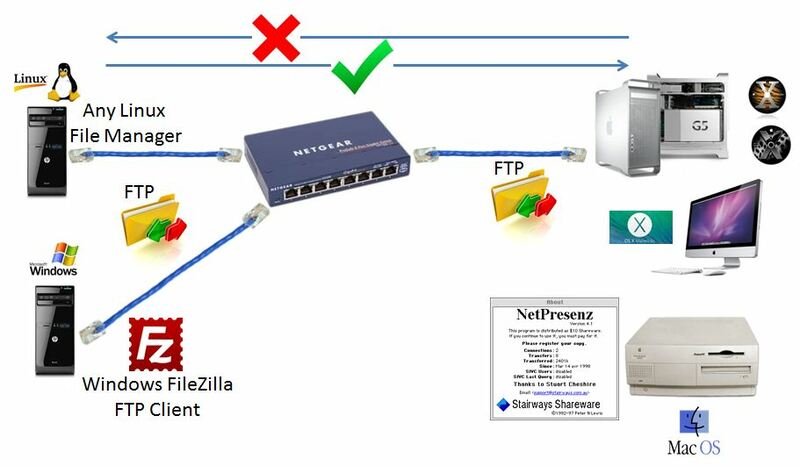 Today’s post attacks the networking problem from a totally different direction – the FTP protocol – using a much lesser known application, NetPresenz. “NetPresenz?” you are thinking to yourself… What the heck is NetPresenz? Names like Fetch and Transmit pop unbidden into your mind when you think of vintage Macs and FTP, and this is not without reason. Both are excellent and well known FTP clients, each providing a means for getting files TO your vintage Mac via FTP, from an FTP site. 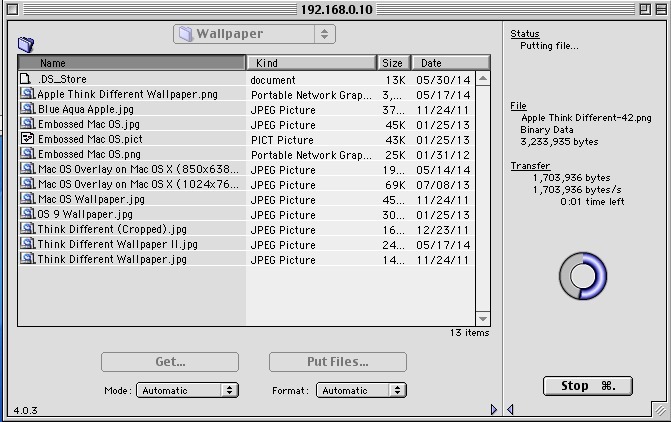 However, what if you want to share files FROM your Mac via FTP? For that, you need a Macintosh FTP server, a job beyond the limited means of FTP client applications like Fetch and Transmit. This is where NetPresenz comes in. NetPresenz is a wonderful freeware package that delivers an FTP Server, a Web Server AND a Gopher server (if you haven’t heard of Gopher before, you can think of it as an early predecessor to HTTP). With NetPresenz and Fetch installed, you can both make your files available to others via FTP, and you can access files that others are making available to you, also via FTP. First things first, as always. You can acquire a copy of NetPresenz 4.1 from http://files.stairways.com/other/index.html. At this location you will also find an excellent and very readable user’s manual for NetPresenz, which I would encourage you to at least browse before starting the application for the first time. Every FTP server needs some files to share and so I created a top level folder on my Mac’s main hard drive which I called simply “FTP Site”. I enabled sharing on it and copied a few small test files into it, so that I would recognize them if/when I was later able to successfully access the folder from FTP. With this essential setup done, I was ready to dive into NetPresenz itself. 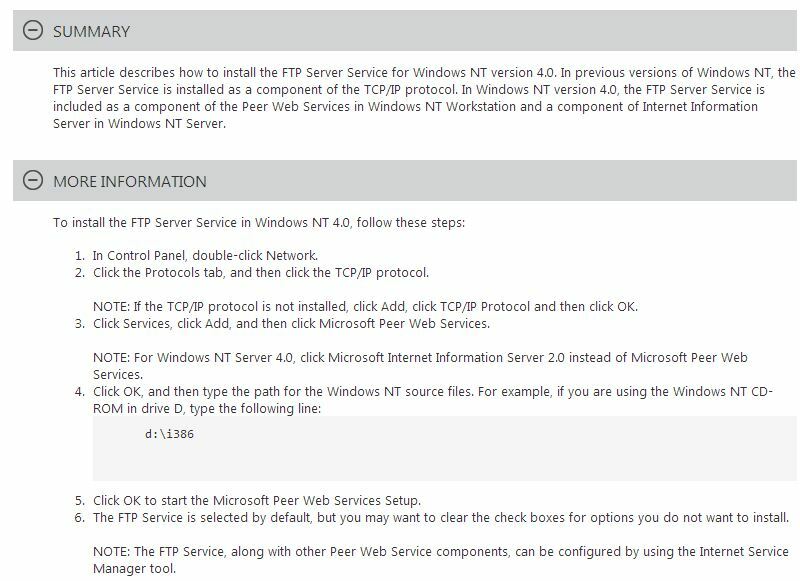 Since the objective of this particular blog post is to setup an FTP Server, I clicked the FTP Setup button, and was led through a simple and obvious series of GUIs related to FTP setup. Most things didn’t have to be changed. 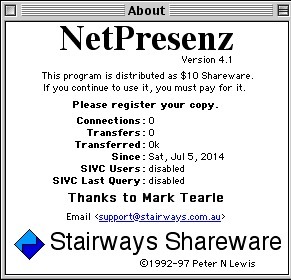 BTW, NetPresenz 4.1 is now officially free from its vendor, Stairways Shareware, and so I was amused when I clicked the “I Paid” button at the bottom of the FTP Setup window, and NetPresenz obligingly said “Thank You” through my Mac’s speakers! Back at the main NetPresenz Setup GUI, I now clicked the FTP Users button and pointed it at the “FTP Site” folder I had established before starting. Finally, I allowed anonymous FTP access to it. That was it! 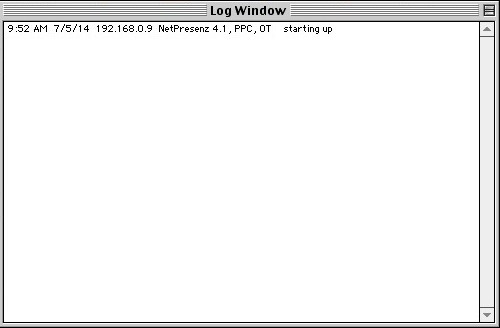 Back at the Install folder, I now double clicked the NetPresenz application itself, and was greeted by its incredibly minimalistic log window as my sole indication that NetPresenz was now serving FTP out onto the HappyMacs network. That was easy! It worked the first time, no muss, no fuss. Through the browser presented FTP page, I was able to download files from the NetPresenz Macintosh, but could not upload: uploading requires a more complete client than a web browser provides. To test uploading therefore, I turned to another trusted Mac OS X standby of mine, CyberDuck. Using CyberDuck on my Power Mac G5 Quad I was able to both upload and download files via the NetPresenz server running on my vintage Macintosh. Once again it had worked first time! Once again I was able to upload and download files to and from the Mac with ease. One nice behavior of NetPresenz that is observable from WS_FTP32 but that cannot not be seen from TenFourFox is the login greeting message. NetPresenz allows you to set per user login greeting messages, so that when a particular user logs in, they are greeted with a customized message. The ability to customize the login message was typical of FTP servers of the day, but it is still a nice refinement. In NetPresenz you can also set per folder greeting messages, such that when a user navigates into any given folder, they get a folder-specific greeting message, but I did not bother with that additional setup. In the meantime, if you look at the last two lines of the above WS_FTP32 screen, you will see the greeting message I had established for user “anonymous” (“Welcome to the 7300/200 FTP Site! Enjoy Your Stay.”). With that, file sharing FROM the Macintosh TO the PC, via an FTP server running on the Macintosh, was fully up and running. Why didn’t I go this way? The quick answer is security. I have read one too many articles to the effect that the Windows NT 4.0 FTP Server is riddled with security holes – a nightmare waiting to happen. All by itself, that is reason enough to look elsewhere, but I was also worried about readers who didn’t have Windows NT 4.0, but rather had Windows 95 (or worse, Windows for Workgroups 3.11) – I wanted a solution for them as well. With this in mind, I went hunting for a generic Windows FTP Server that could be installed on at least Windows 95 and Windows NT 4.0. After going down many a blind alley, I finally came upon acFTP, an open source FTP Server whose only stated requirement is Win32. This made it perfect for both Windows 95 AND Windows NT 4.0 (…and it might even work on Windows for Workgroups 3.11 with Win32s installed… who knows! I didn’t try this – if you do, let me know how it went!). You can pick up a copy of acFTP at http://sourceforge.net/projects/acftp/. 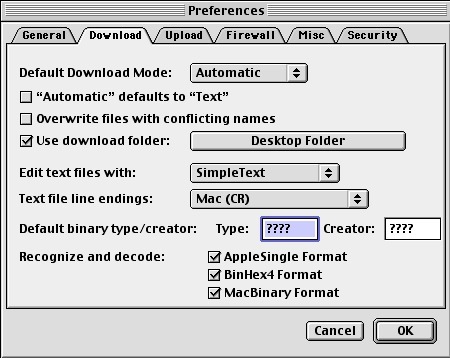 I won’t go into the Windows NT 4.0 installation and setup of acFTP – this blog is about Macs and not PCs after all! However, it was straightforward and direct, and the FTP server was up and running with almost no effort. I wonder whether the author of acFTP was inspired by NetPresenz, or perhaps visa-versa? acFTP sports the same incredibly minimalistic style of user interface that NetPresenz employs, providing only a log window as evidence that it is running. If possible, acFTP is even more minimalistic than NetPresenz – configuration is accomplished solely through text based configuration files, without even the GUIs that NetPresenz provides. acFTP may be minimalistic, but it was effective, and it successfully served FTP out onto the HappyMacs network. All I needed now was a Macintosh-based FTP client. For this, I picked Fetch. 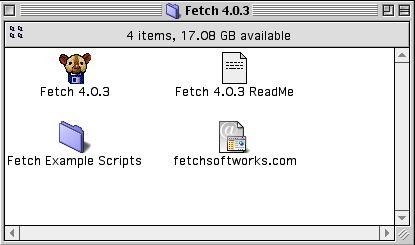 Fetch was my “go to” FTP client “back in the day” when I was lucky enough to have a Macintosh on my desk as my day-to-day computer at work. Without question, this made Fetch my first choice. As I mentioned earlier however, Transmit is another very popular choice of FTP client for Mac OS Classic, if you wish to try something different. You can get both Fetch and Transmit from the Macintosh Garden at http://macintoshgarden.org/apps/fetch-212 and http://macintoshgarden.org/apps/transmit-17, respectively. As was the case with NetPresenz, installation of Fetch is a doddle – just copy the Fetch folder to your Mac’s Applications folder and run the application. Pretty darn simple! As you can see from the above, I pointed Fetch at something a little more beefy than the simple test files I had set up for NetPresenz testing. I established a folder full of programs, screen shots and wallpaper images, and then proceeded to both download (Get File) and upload (Put File) files to/from this folder using Fetch. Both directions worked flawlessly. With that, sharing files FROM a PC TO a Macintosh over FTP was also now fully up and running. 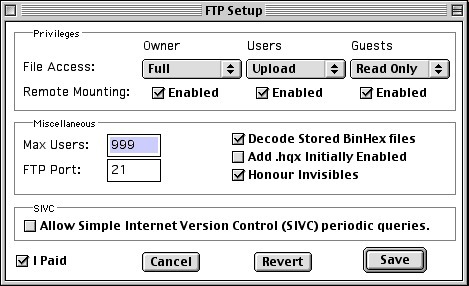 We have seen that you can set up your vintage Mac to be either an FTP Server, via NetPresenz, or an FTP Client, via Fetch (or any one of a number of other excellent Macintosh FTP clients, as you wish). With your Mac set up as an FTP Server, you can share files directly with vintage PCs with your Mac providing the common ground. If your Mac is set up as an FTP client, you can share files directly with vintage PCs running an FTP server such as acFTP with the PC acting as the common ground. 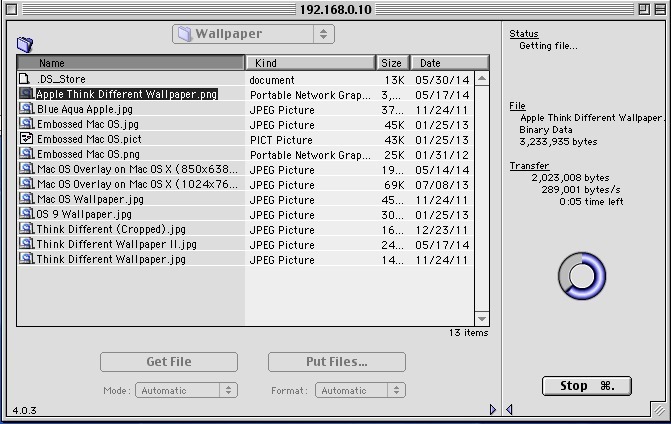 Of course, you can also do all of this indirectly, using as a middleman any FTP server that is visible to both the Mac and the PC. That’s it for this installment of the networking series. In the next installment, we will look at sharing files from your Mac to a PC (and to almost anything else that supports HTTP) using a clever and almost completely forgotten gem that Apple debuted in Mac OS 8. Until then, happy FTP’ing! In the first post of our series on networking your classic Macintosh with Windows, we examined the use of Thursby Software’s Dave, and found it more than equal to the task. In this post, we will look at use of Connectix DoubleTalk, the other classic solution in this space. If you haven’t read Part 1 of this series, it might be useful to go back and check out at least the initial paragraphs, as they lay out some background details that will make what follows a lot more understandable. Alright, let’s network with DoubleTalk! It is important to know that DoubleTalk is more limited than Dave – it only provides an SMB client. This means that a DoubleTalk-equipped Mac can read and write files to and from a Windows machine, but a Windows machine cannot even see a DoubleTalk equipped Mac on the network, much less read and write files to and from it. BTW, you can download a copy of DoubleTalk from the always valuable Macintosh Garden, at http://macintoshgarden.org/apps/connectix-doubletalk. DoubleTalk may only provide a one way Mac -> PC connection, but even a one way connection is quite valuable, and I am pleased to report that DoubleTalk does a very good job at providing it, at least after a little jiggling to get around the “blank list of shares” problem. 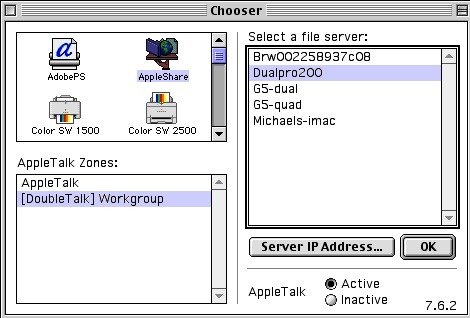 Installation and configuration was simple and fast, and finding Windows machines on the network was as seamless as selecting the AppleShare DoubleTalk Workgroup zone in Chooser. The available PCs obligingly showed up in the right hand pane, ready to be mounted and used. At this point however, the “empty list of shares” problem raised it head, as it did with Dave in Part 1 of this series. When I selected the PC of interest (Dualpro200), DoubleTalk presented me with a blank list of available shares, leaving me with nothing to connect to. I could “see” the PC of interest, but could not connect to any shares on it. As we saw in Part 1 of this series, this problem was easily resolved at the PC end of the link, by reducing the share name length of the PC’s shared folder to 12 characters or less. However, the workaround to the “empty list of shares” problem is instructive, and so we carry on as if we had not solved the problem in this manner. Unlike Dave, there is no Add Share button in DoubleTalk, and thus it would appear that you are stuck. Happily, this is not the case. 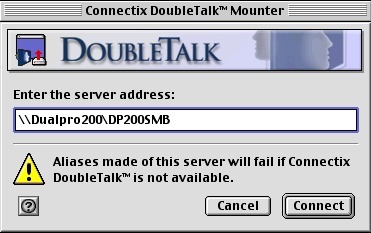 The copy of DoubleTalk that I downloaded from the Macintosh Garden included both Version 1.0 of DoubleTalk and a Version 1.1 updater. I had installed both and so was running Version 1.1. Consulting the documentation that came with Version 1.1 (excellent, by the way), I discovered that Version 1.1 added support for something called the DoubleTalk Mounter, a capability that is functionally identical to Dave’s Add Shares button. Available from DoubleTalk’s control strip module, the Mounter pops up a dialog that allows you to directly type in the names of shares that you want to mount. These are the same share names discussed in Part 1 of this series, in the “blank list of shares” portion of the Dave description. There is one caveat. 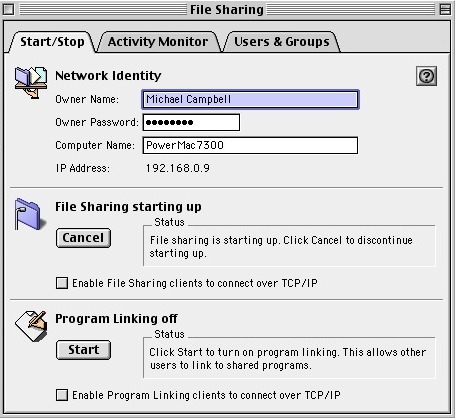 The names have to be entered as fully qualified network names, including both the computer name and the share name on that computer, together as a single path name. 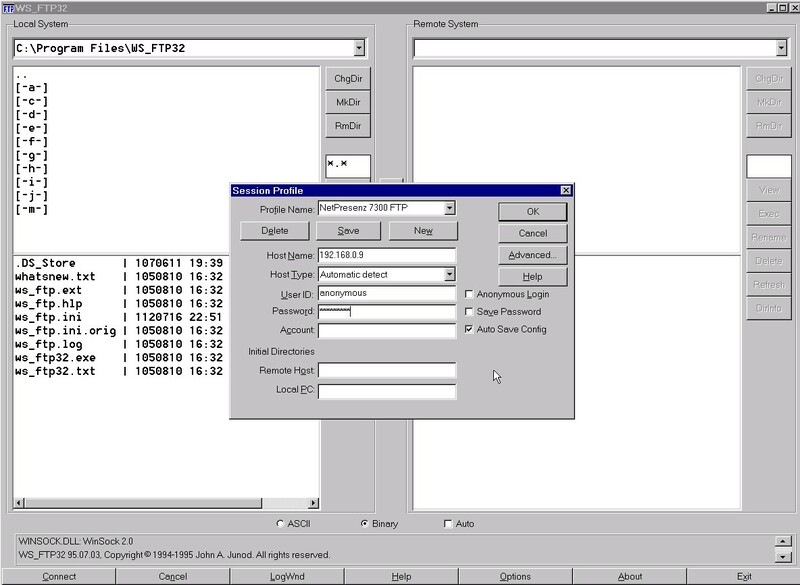 The computer name is the name you assigned to the PC in its Network Control Panel, preceded by two back slashes, and the share name is the same share name mentioned above. Putting this together, for the PC named Dualpro200, and the share on that computer named DP200-SMB, the fully qualified path name would be “\\Dualpro200\DP200-SMB”. and DoubleTalk took them all. Once the above was taken care of, mounting PC shares was a simple and seamless exercise with Chooser, identical in operation to Mac OS based server connections. Reading and writing files on the Windows machine was an intuitive exercise in drag and drop and was identical to doing the same with Mac files and folders. 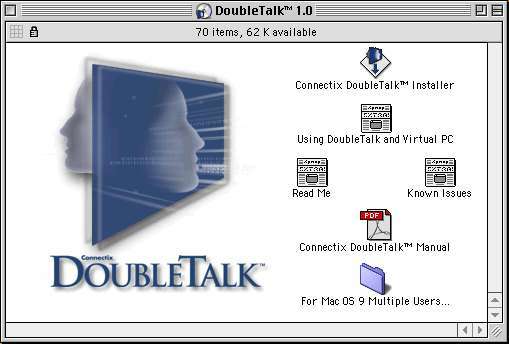 All in all, DoubleTalk provides a very simple and usable experience that achieved the desired result of trading files between a Classic Mac and a Windows machine, if only in one direction. Mac to PC networking via DoubleTalk was up and running! On the PC side, make sure that you have one or more shared folders, and take note of the “Share Name” name you assign to each. 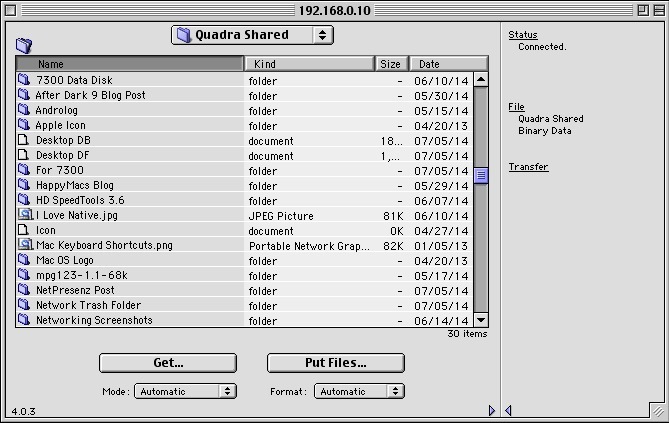 Keep the filename of each shared folder to 12 characters or less. Still on the PC side, if you CANNOT keep the share names to 12 characters or less (perhaps the machine is not under your control), compensate for this on the Macintosh side. On the Macintosh side, when you use Chooser to select the PC, if you are greeted with a blank list of available shares, use DoubleTalk’s Mounter to manually add the shares whose names you took note of in the last step. If you have to use Mounter to add your shares, you will have to repeat this step each time unfortunately. Unlike Dave, DoubleTalk does not remember the names between sessions. That’s it! Apply the above and you should be happily networking between a Macintosh running DoubleTalk and a PC running Windows NT 4.0. That’s it! 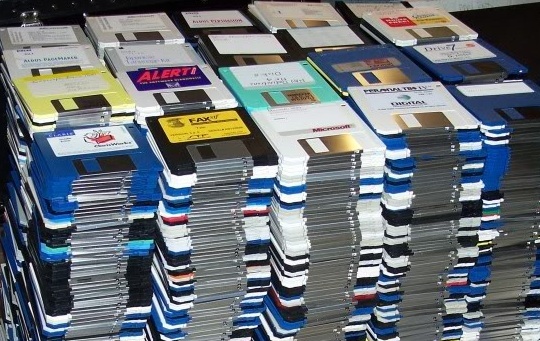 This completes our roundup of “classic” solutions to the Mac-Windows file sharing need. In Part 1 of this series, we have looked at Thursby’s Dave and in this post, Part 2 of the series, we have looked at Connectix’s DoubleTalk. This author recommends Thursby’s Dave for people wishing to network their classic Mac with a Windows machine, but as we have seen above, Connectix DoubleTalk does a very able job as well, albeit in one direction only. 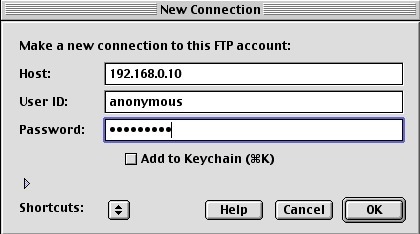 In the next post in this series, we will look at using a Mac OS Classic FTP server to enable Windows (and Linux as well!) to access files on a Mac, complemented by a Mac OS Classic FTP client to enable the same in reverse. Until then, Happy Networking with EITHER Dave or DoubleTalk!